Nokia 8 User Guide PDF From Beginners to Advanced - Get Nokia 8 user guide here, this nokia support available in nokia 8 user guide pdf. The beginners is how to and and advanced guide is an expert to use the hidden features. Nokia 8 notification light keep you stay in touch with Nokia8 panel show you notifications such as receive new messages or missed calls. The indicator icons will appear on the status bar at the top of the screen. See more information about the Nokia 8 icons by open the notification panel and view the details. To close the notification panel, swipe upwards on the screen. Tap the app name to open the app settings. Tap quick setting buttons in the notification panel to activate features. To see more quick setting buttons, drag the quick settings menu further down. Avoid touching the antenna area while the antenna is in use, if you contact with antennas affects the communication quality and may reduce battery life due to higher power level during operation. Do not connect to products that create an output signal, as this may damage the device. Do not connect any voltage source to the audio connector. If you connect an external device or headset, other than those approved for use with this device, to the audio connector, pay special attention to volume levels. You can switch on your phone for the first time, and check the battery level to ensure you get best battery life. Nokia phone guides you to set up your network connections and phone settings. 1. Switch your phone on and choose your language. 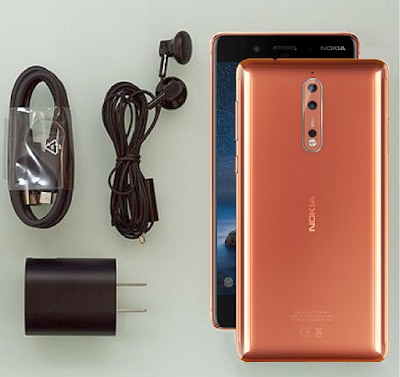 The Nokia 8 dual SIM can help some people to manage the internet data service by choose the cheaper provider on the data settings use SIM 1 or SIM 2. You can protect your SIM card against unauthorized use or are required to access some features by use a security code. You can set your phone to ask for the PIN code when you switch it on. When you forget the security codes or they aren't supplied with your card, you can contact your network service provider to help you. Download Nokia 8 user guide/ Nokia 8 User Manual in PDF complete full version here. Nokia 8 specificatiosn powered by CPU Qualcomm® Snapdragon™ 835 Mobile Platform, Octa core, (4 2.5GHz Qualcomm® Kryo™ CPU + 4 1.8GHz Kryo) supported operating system Android™ 7.1.1 Nougat and will keep update to the latest versions. RAM 4 GB LPPDDR4X, internal memory 64 GB, external memory MicroSD card slot Up to 256 GB, and the battery 3090mAh features splashproof (IP54). The fornt camera 13 MP PDAF, 1.12um, f/2.0, 78.4°, display flash, and rear as primary camera 13 MP (Colour + OIS) + 13 MP (Mono), 1.12um, f/2.0, 76.9°, PDAF, IR range finder, using dual tone flash. Our Nokia 8 camera review for this phone Nokia 8 features a 13 MP dual image-fusion rear camera with both colour and monochrome sensors, plus a wide-angle 13 MP phase detection auto-focus front camera. 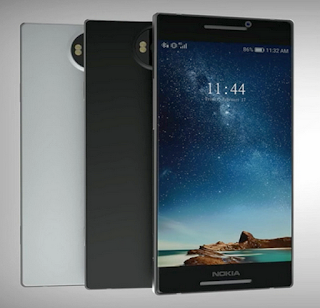 You can maximize performance Nokia 8 built in a full-length copper cooling pipe with graphite shield to dissipate system heat across the full body of the phone. 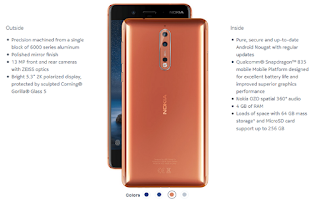 Get the latest informations about new Nokia phones such as Nokia 9 and Nokia X the release date, specs, unboxing, user guide, tip and tricks with our tutorial also our review on the next post.